Posted on November 8, 2016 at 10:26 am. Top casinos in France are trialling a security upgrade with MeReal Biometrics smartcards set to be tested early next year. The smartcards will be rolled out at two Groupe Partouche casinos – the first open air casino, Casino La Ciotat, and Casino Juan Les Pins – both located in the French Riveria in early 2017, and employees will be first to trial them. 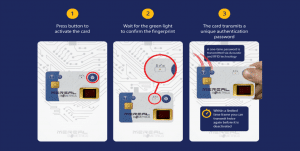 The MeReal Biometrics is a ‘computer on a card’ and uses fingerprint technology to confirm the user’s identity. This is done via a sensor, an acoustic signature, and a rechargeable battery all combined into a card, which can be used for secure payments and other applications by confirming a match with the holder. The security via electronic means is the main feature which the casinos will be aiming for with employees testing the system out first. If successful, it will then move to being a viable options for guests. Chairman of the Board of Group Partouche, Fabrice Paire, said this will improve the overall casino gaming experience in popular games such as French Roulette if successful, and prevent the potential for card fraud in their venues. “The fingerprint sensor brings trust and security to the Groupe Partouche experience, a key component to our core values,” he said. Head of Marketing of MeReal Biometrics, Kate Davies, said this card will speed up check-in and provide easy access to areas, including high roller gaming areas. The card also offers audio applications – after the identity of the cardholder has been confirmed it can communicate to the world’s s 8.3 billion telephone lines, from smartphones through to fixed lines for a short period of time. It is also compatible with mobile apps, USB readers, door readers, car readers and more. There are so many benefits to this new form of technology – those itching to get onto the gaming floors will be able to bypass check-in and head straight there, while VIP or tournament players won’t have to waste time registering. But perhaps the best feature to these cards is the high level of security protection they offer. Card fraud and other identity security issues are a huge problem at land based casinos and this will protect both the operators and the players. We hope these cards are successfully implemented and will eventually immigrate to land-based casinos in United States. In the meantime, you can play at Raging Bull Casino on desktop and mobile devices and enjoy the highest standards of security and regulation offered for real money online players – along with hundreds of the world’s best slots and table games available at the tip of your fingers.